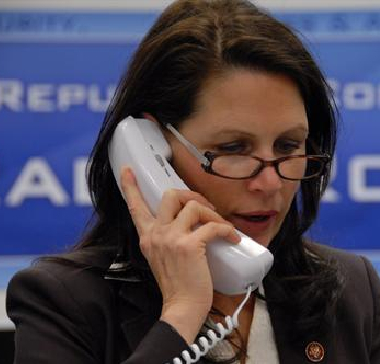 Michele Bachmann answers a pretend phone. Up to this point I’ve found Michele Bachmann sort of an entertaining sideshow to the still-15-months-from-being-over 2012 election coverage. With her crazy googly eyes, faith-based approach to the facts, and 137 foster children, she has played more like a cartoon character than a serious candidate. But today she jumped the shark. I don’t know how much God has to do to get the attention of the politicians. We’ve had an earthquake; we’ve had a hurricane. He said, ‘Are you going to start listening to me here?’ Listen to the American people, because the American people are roaring right now. They know government is on a morbid obesity diet and we’ve got to rein in the spending. On the face of it, this is nothing we haven’t heard before from wingnuts of the Pat Robertson persuasion; the arrogance it takes to think you know what God is thinking is staggering, but it’s not surprising. Bachmann spokeswoman Alice Stewart said Monday morning that the candidate was joking and that her comments weren’t serious. “Obviously she was saying it in jest,” Stewart told Talking Points Memo. Politico posted a short clip of Bachmann’s comments from a different portion of the speech, where her tone is on the lighter side. Thing is, even if we bought that…it only makes things worse. Like, I’m sure the families of the 26 people who have died in Hurricane Irene (so far) found it hilarious. The whole thing makes me want to retch. Michele Bachmann, you can go away now. We’re done with you. This entry was posted	on Monday, August 29th, 2011 at 6:49 pm	and is filed under Whatever Else. You can follow any responses to this entry through the RSS 2.0 feed. You can leave a response, or trackback from your own site. And going from bad to worse, Bachmann is being surpassed by an even righter religious-righter (if that were possible), Rick Perry. She was joking. I heard a clip of the speach and the audience found it funny. I hate her, but I think you are going over board on this one. Not that big of a deal. I liked better that she said she came from the same town as John Wayne, but really it was John Wayne Gacey that was from there. Perhaps the message that God was trying to give DC was “Climate change is real”.